Detention should be used as a last resort for the shortest possible time period, given it exposes children to dangerous situations and can reduce the likelihood of successful rehabilitation. 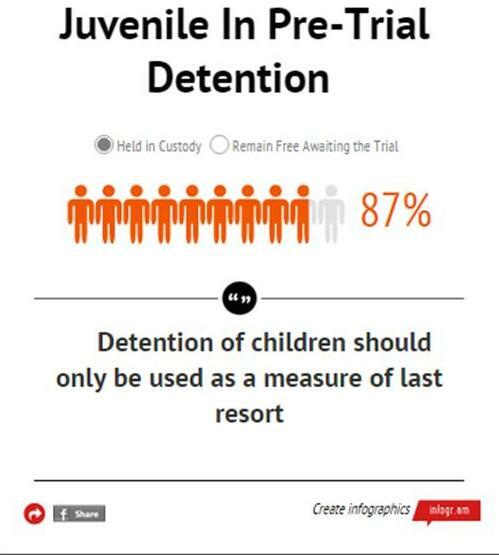 However, based on the reports findings 87% of juveniles were put in pre-trial detention. Furthermore, trials involving juveniles should not be open to the public and reporting should be restricted. Of more than 200 cases involving juveniles, only three took measures to protect the privacy of the juveniles involved. Finally, imprisonment should be a last resort and only used in exceptional cases. Other measures such as “Care, guidance, supervision orders; counseling; probation, foster care; education and vocational training programs […]” should be prioritized over imprisonment. Instead, juveniles are incarcerated in almost all cases. CCHR found only one case in which the juvenile was not incarcerated. Cambodia is bound to uphold the United Nations Convention on the Rights of the Child (the “CRC”), as outlined by the Constitution of Cambodia. While the Cambodian legislative framework provides some protection, it does not include a clear set of laws relating to the rights of children, or provide procedural guidance for juvenile justice. Overcoming these violations requires significant reforms. Fundamentally, upholding these rights would require an increase in resources. For example, ending pre-trial detention and implementing alternative sentences are difficult without supervision measures and adequate funding. However, courts also lack training and sensitivity when dealing with juveniles. CCHR calls on the Royal Government of Cambodia (the “RGC”) to adopt a draft Juvenile Justice Law, which should include guidance on how to provide different treatment to juveniles and address the issues outlined above. While overcoming these violations may seem challenging, the costs of inaction are simply too high. The development of children should be protected at every step, and violating the rights of juveniles can have a determinative impact on a child’s future. Yet currently the Cambodian judiciary is blind to the needs and rights of children as they pass through their courtrooms. The judiciary, a symbol of justice and fairness, should be able to deliver more to juveniles, who represent some of the country’s most vulnerable citizens. This entry was posted in Children's Rights, Judicial Reform and tagged Cambodia, Children's Rights, Convention on the Rights of the Child, fair trial rights, Human Rights, justice system, juvenile justice by Cambodian Center for Human Rights. Bookmark the permalink.